Oh, lovely greens that are perfect for this time of year! I'm so excited to have editor friend Ami of Elizabeth Anne Designs here today to share a little seasonal appetizer of what her blog is known for: beautiful, chic, and timeless wedding inspiration. With minty greens and soft teals, it's without a doubt perfect for any Hampton Roads garden wedding! 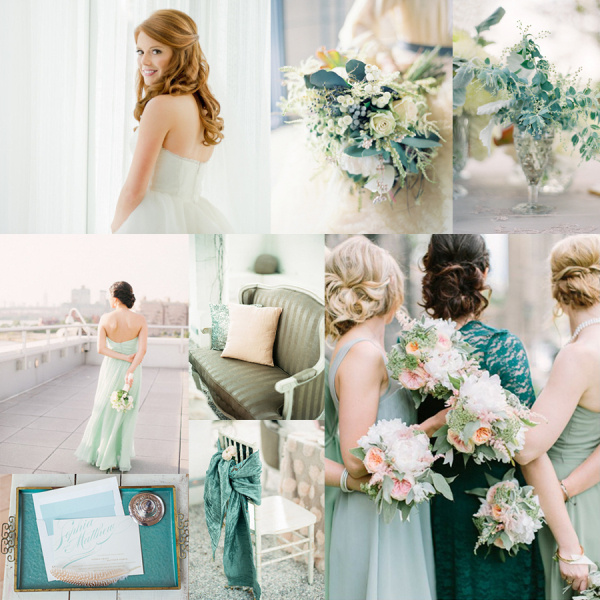 I am completely head-over-heels for this chic color scheme of mint and teal! Beautiful for all seasons, especially spring and summer, mint and teal give the perfect palette for a sophisticated celebration. With pops of buttery yellow and pale pink, it adds a romantic touch when paired with a textured mix of lace, chiffon, and silk. And of course, mismatched bridesmaid dresses are still on trend and photograph perfectly in these colors! Get to know Ami and her EAD Team through their gorgeous classic wedding inspiration on Pinterest, Twitter, and Facebook.